3rd August 2011 – Allotment Plot 326 – Ella Montt almost randomly broadcasted a mix of seeds in the cleared area where the Peas had previously been. The area was still surrounded by shading netting. The mix of seeds consisted of Carrot Amsterdam Forcing, Calabrese Baumont F1, Cabbage Wintergreen, and Oriental Tai sai. It was hard to know if any of theses seeds would germinate and grow. Ella Montt’s success as a grower seemed to vary. Through the combination of both Allotment Plots, a level in vegetable self-sufficiency had currently been met and stabilized. The soil at Allotment Plot 326 is more fertile than Allotment Plot at MERL, yet vegetables such as Peas and Beans seemed to be just as successful at either Plot. What has become noticeable at Plot 326 is the ability of the Plot to produce substantial amounts of Courgettes and Squashes (which are also forming). 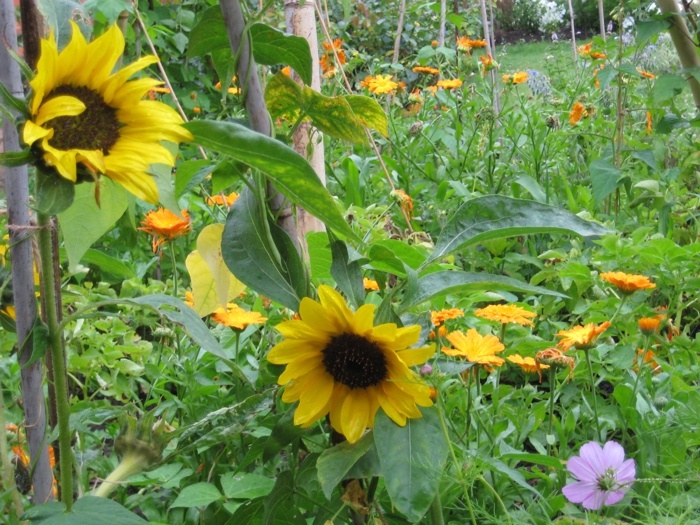 Allotment Plot 326 has prolific self-seeded wild plant growth that is not yet tamed. Allotment Plot at MERL’s plant growth looks wild. Its cultivation although tamed by the edges of the Plot, has no regimented construction or uniformity. 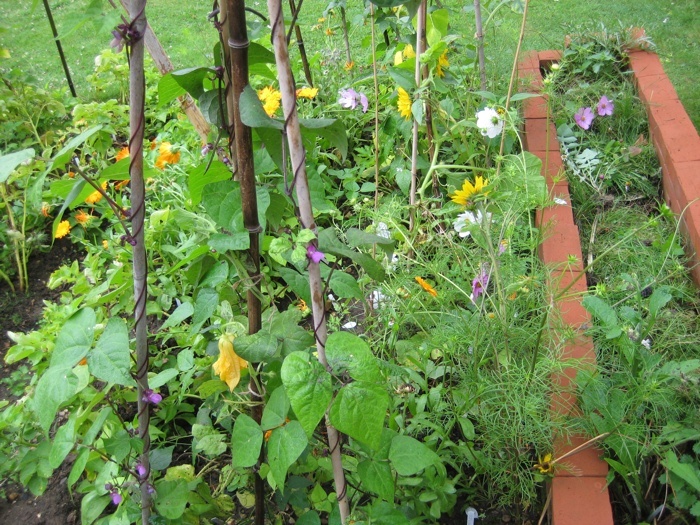 The plants do not exist in straight lines, (as archival ‘how to grow’ gardening material suggests), or if the lines are apparent, they dissolve in to wild often self-seeded, Companion Planting. Harvest: a mix of Peas = 5oz = 140g; a mix of Perpetual Spinach and Chard = 6oz and 160g; 1 x Courgette Cocozelle = 1lb 10oz; 5 x Courgette Patriot F1 = 2lb 9oz = 1.18kg, Potatoes Madeleine = 1lb 14oz = 870g. 4th August 2011 – Allotment Plot at MERL – It had rained all morning giving relief after a few hot, dry days. Ella Montt redefined the Plot, removing plant residue to the Brick Composter. The greens of the vegetable plant material and Companion Planting blended with each other to produce a mass of interdependent organisms. 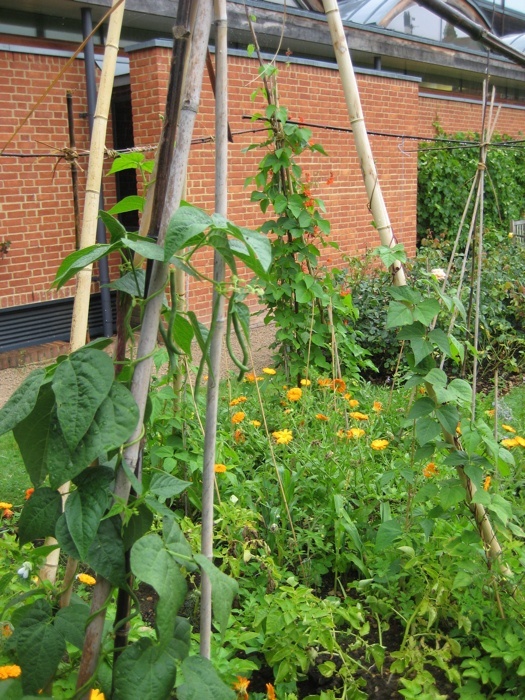 It was hard to see where one plant ended and another began within the confinement of the Plot and the density of planting contributed to the survival of the fittest. Ella Montt followed the paths of each Squash plant to their roots and then encouraged the vines to grow up the bamboo canes to seek more sunlight. A few of the Squash and Tomato plants that had been transplanted earlier in the season looked like they will not survive. The effects of too many cold nights have taken their toll. Plants that had taken longer to grow and that had been transplanted at a later date were pulsating with life on their way to maturity. Harvest: Runner Beans Enorma = 8oz = 210g; French Bean (Climbing) Neckarqueen and Blue Lake = 3.5oz = 40g, Blauhide = 1oz = 20g; Rainbow Chard = 1.5oz = 40g; Wild Rocket = 2oz = 50g. 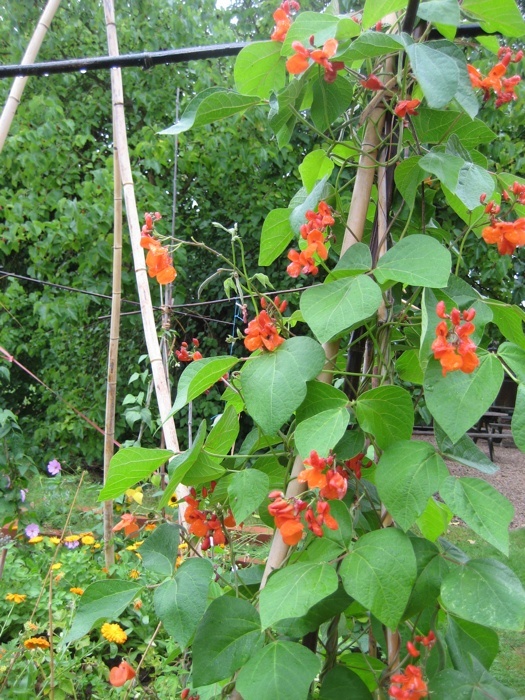 This entry was posted in Allotments, Harvest, Plant and tagged Allotments, Green, Harvest, Self-Seeded, Wild on August 6, 2011 by katecorder.